The city of Auburn is located in the Puget Sound region of northwestern Washington. It has over 70,000 residents, making it the 14th largest city in the state. 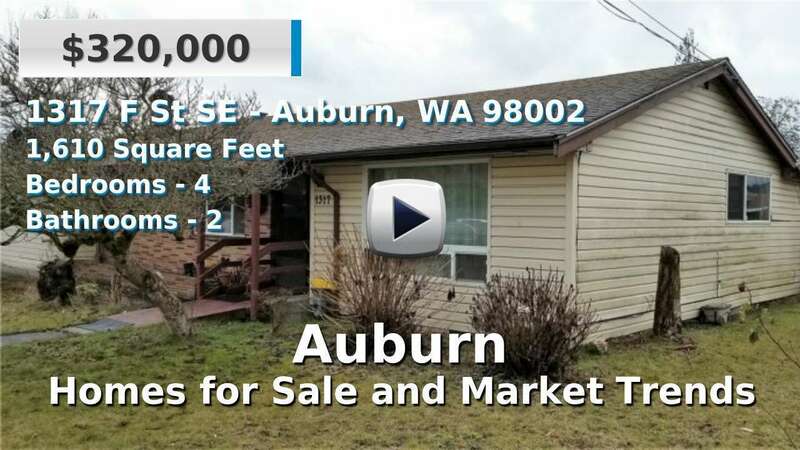 Auburn is east of Federal Way and Tacoma, south of Kent and Seattle, and north of Lake Tapps and the Muckleshoot Reservation. It is a densely populated urban area of Pierce County, but has several parks and an environmental wetland preservation area near the Green River. The city is known for its industries and location between Seattle and Tacoma, with easy access via train and highways, and commutes taking an average of 29 minutes. Auburn boasts some of the best views of Mt. Rainier across the valley. The city also offers ideal living opportunities, with a large selection of houses and condos for sale in their unique collection of neighborhoods throughout the city. 5 Beds | 2.75 Baths | 3225 sq. Ft.
4 Beds | 2.5 Baths | 3010 sq. Ft.
2 Beds | 2 Baths | 3013 sq. Ft.
3 Beds | 2.25 Baths | 1650 sq. Ft.
4 Beds | 2 Baths | 1440 sq. Ft.
5 Beds | 3.25 Baths | 2650 sq. Ft.
4 Beds | 3.5 Baths | 2393 sq. Ft.
4 Beds | 2.5 Baths | 2477 sq. Ft.
5 Beds | 2.75 Baths | 2097 sq. Ft.
5 Beds | 2.75 Baths | 3168 sq. Ft.
5 Beds | 2.75 Baths | 2905 sq. Ft.
3 Beds | 2.5 Baths | 2510 sq. Ft.
4 Beds | 2.25 Baths | 2360 sq. Ft.
2 Beds | 1.5 Baths | 1099 sq. Ft.
2 Beds | 1.5 Baths | 1160 sq. Ft.
2 Beds | 2.25 Baths | 1275 sq. Ft.
3 Beds | 2.5 Baths | 1259 sq. Ft.
2 Beds | 2.25 Baths | 1391 sq. Ft.